In recent years we’ve all heard that we need to increase our step count 10,000 steps per day is the goal which roughly equates to 5 miles per day. Now a vast percentage of the population own some kind of wearable technology such as a Fitbit (other brands are available!) so they can measure their daily steps and make sure they hit that magic 10,000!! So where did it all come from? Public health research shows that currently, around 3 million middle-aged adults are inactive in the UK. Add to that that in comparison to 1977, the average adult, by 2010 burned less calories per week to equate to each of us being able to run a marathon. This is largely through the introduction of energy saving devices, for example, dishwashers vs hand washing, tumble dryers vs a mangle, power steering in cars. The government decided to take action and introduce the steps target. There is much debate currently over where the figure ’10,000’ came from, however it is recommended that the 5 miles is a sufficient distance to see some impact on health. So, which is more important, steps or distance? It depends on how you get you steps for starters…5 miles run will probably not equate to 10,000 steps however that doesn’t make it any less effective. Similarly, if you regularly hit 3,000 steps in your normal daily routine, just increasing it by 1,000 steps per day will make a significant difference to you. With this school of thought, you would continue to gradually increase your steps over a longer period of time until you are regularly hitting the 10,000 every day!! I believe there has been great uptake of people hitting their step count all across the UK, however further research concluded that although people were doing their steps, they may be very sporadic across the day. As a response, the government created Active 10. It is a free app that encourages people to do 10 minutes of continuous activity every day. There have been questions as to how 10 minutes per day is helpful when 150 minutes would be the ACSM (American College for Sports Medicine) guidelines per week. 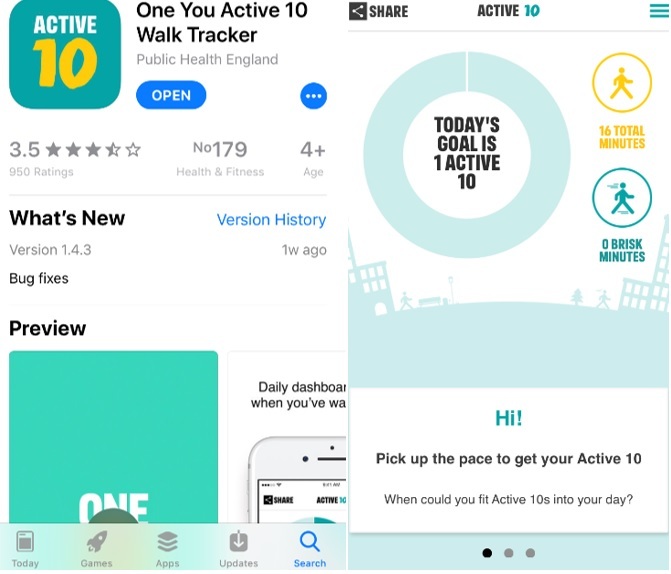 The idea of the 10 minutes is aimed at those who are not currently achieving even that and the app encourages increasing the period over time so you can build up to that 150 minutes in a way that is manageable and progressive, just like that step count! At Body Happy we aim to get all of our clients more active both in our sessions with them but also in their day to day lives. For more information on our training options visit www.body-happy.co.uk.